You are here: Home / General / Is the iPad Making PC Makers Desperate? The products are made possible by better, cheaper components, by the new touch interface in Windows 8 and by Intel’s ultrabook formula. But they’re also driven by a sense of urgency among PC makers, desperate for a hit product that can outrun the iPad and revive their fortunes. I think this is at least partly wrong. While traditional PC makers like HP, Dell, Acer, Lenovo, ASUS, and the like are absolutely facing an uphill challenge against products like the iPad, mere survival isn’t all they’re trying to accomplish here. I’d say that they’re also struggling to make devices that are actually productive. I own an iPad, and while it’s great for consumption and (very light) production of content, it simply is NOT a truly productive tool. The documents one can work on are exceedingly simple, and anything more than brightening a photo or cutting a short video is impossible. The thing’s just not fast enough and doesn’t have enough working memory to accomplish much, and the simplicity of the apps are great for casual use but excruciatingly limited—pretty much on purpose. And that’s not to mention the relatively small screen size (my desktop PC has two 24” monitors attached) and the inherent limitations of a touchscreen-centered user interface. It seems to me that rather than simply compete against the iPad, these companies are trying to advance the tablet form factor into something that can work to get real work done. After all, if you want to write something longer than a short email or Twitter entry on an iPad, you pull out your Bluetooth keyboard. Once you’ve done that, you’ve now turned the iPad into something very similar to the hybrid devices shown off at Computex, only without the extra benefits (like extra battery life and active digitizers and pens). In other words, you’re no longer actually using the iPad as a tablet. I want a device that can run full “desktop” apps like Office 2013, Photoshop, and Premiere, that’s light and portable, but that can plug into a real keyboard, have long battery life and turns on instantly, and can also suffice for ebook reading a quick game of Angry Birds. So far, the iPad can’t do that, and neither can the Windows Tablet PCs of yesteryear. 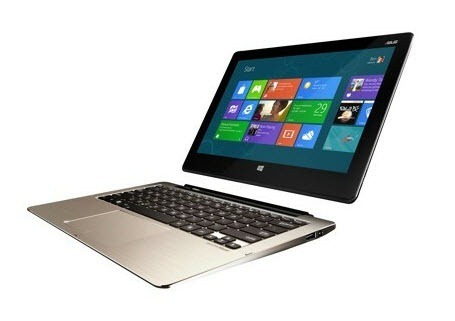 But smash those two together, as ASUS seems to be doing with the Transformer Book, and now we’re talking. I hope the PC makers are successful, because I simply think they have actual productivity in mind. Given its increasingly consumer- and media content-focused mentality, I’m not sure the same can be said for Apple. ASUS is on the right track with the Transformer Book, which is a real computer in a tablet format with a usable keyboard. If they and Microsoft can get the right mix of performance and casual touch-friendliness (which remains to be seen, of course), then finally we might have tools that work for both consumption and production.